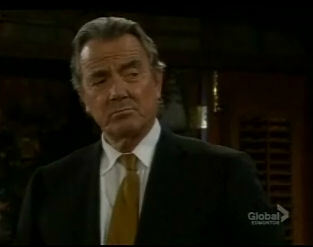 The Y&R Update Tuesday 11/2/10--Canada; Wednesday 11/3/10--U.S.A.
Lily walks into her home, and catches Blake there with Cane. She left the babies with Neil, and stopped by to pick up some warmer clothes for them, and was hoping to see Cane alone. She's cold to Blake, and seems suspicious. When Blake introduces himself as a friend of Cane's, Lily thinks she's seen him before. Blake tells her that they haven't met, but he just has a familiar looking face. Lily hints at Cane's trouble in Australia, and asks if Blake is connected to that. Cane tells her that they'll talk about it later, but Blake says Lily has the right to know. He tells her yes, he is there because of the trouble Cane got into in Australia. Blake says that Cane called him for help after he found out that there was a price on his head, and that he happened to be in Chicago on business when he got the call. Cane listens, nervously. Lily asks Cane if he didn't know Blake was in the country, and Cane hesitantly says that he didn't. Blake says he made some phone calls to law enforcement, and that the people after Cane won't be bothering him anymore. Lily smiles, and asks Cane if it's true. Cane says it is, but he didn't want to say anything until he was sure. She hugs Cane, and says they finally have their lives back. Cane glares at Blake, who smiles back at him. Blake tells Lily a story about hanging out with Cane on a boat. Lily clearly likes Blake, and thanks him for taking care of things with the cattle rustlers. She then invites him to dinner, and suggests she get the twins, so he can meet them. Cane says that it will be their first night back at home, and says to do it another time. Lily goes to tell Neil that the danger is over. Blake says he understands why Cane wants to protect Lily, because she's precious. Cane says that Blake has his money, and that he's never to come near Lily or the children again. Blake says Lily is happy that the children are moving back home. He then comments on the kangaroo on the wall of the babies' nursery, and menacingly says it will remind them where their father came from. When Lily returns, Blake is gone. She tells Cane that Neil said that they can pick up the babies any time. She says she thought Blake was nice, and is glad Cane reached out to his friend. She hopes Blake wasn't offended that she was standoffish at first, and Cane says he doesn't blame her for being suspicions after all they've been through. Lily hugs Cane, and says she loves the way he protects them. Cane says he'd do anything to keep her safe. Lily knows. She goes to tell Edward, the bodyguard, that she won't be needing him anymore. Blake goes to Crimson Lights and speaks with the waitress about where to rent a room. She recommends the Athletic Club. Blake says he's new in town, but has found a great investment opportunity, and will be staying awhile. She asks if he's there for business or pleasure, and he says both, hopefully. If his investment works out, he plans to make millions. Katherine, and Ronan go to visit Murphy so he can give his statement about what happened at the festival. Kay tells Ronan that Murphy is anxious to tell him what happened. Ronan starts to question Murphy, then notices him tapping his finger. He asks Kay if Murphy has been doing that a lot, and Kay says he has. Ronan tells her that he thinks it's Morse code. He asks Murphy if he's right, and Murphy tells Ronan that he is. Kay is shocked, ans asks how Ronan knew. Ronan says he learned it awhile ago, and says they're going to find out how much he remembers. Mac uses Morse code to spell out words for Ronan. He spells out some that we don't see, then spells 'Danger.' Kay says That's it. I'm making that phone call now. and makes a call. Murphy's room, and bed are shown, and they are both empty. Ronan's pad is on the bed, with the page he was writing on ripped out. At the Ranch, Meggie makes a call to have the Newman jet available tomorrow. She says not to tell Victor, because it's a surprise from his fiancee. She packs a bag, then calls a hotel and books the honeymoon suite for one night. After she hangs up, she pulls out her vials and blue pills, and says that one night is all it will take, once she's married to Victor. At Solidarity House, Victor confronts Deacon for being there. He tells him that he's the reason that Nikki is in rehab. Deacon says he's there to get clean, just like Nikki. 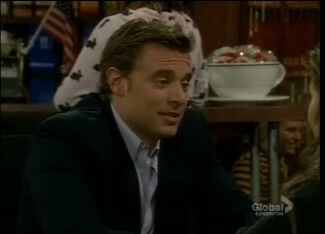 Victor starts to yell at Deacon, that and says he's only there to undermine his ex wife's progress. Victor tells Deacon that if he targets his family, he'll have to answer to him. A staff worker walks up, and tells Victor that he's disrupting the other patients. Victor tells her that Deacon is a con artist, but she says that she won't have him hurling accusations at people. Victor promises to stop, and she leaves. Deacon says that he hasn't done anything to Nikki or Victor. Victor stares Deacon down, and says he doesn't want to hear another word, or he'll do something to him that they'll both regret. Nikki rushes out of her room, and tells Victor to stop, and scolds him about causing a scene at the place where she's getting help. Victor calls Deacon a hoodlum, and says he's the reason why Nikki is there. Nikki says that she started drinking before she ran into Deacon again, and when she saw him at AA, he was trying to inspire people, but her urge to drink was too overwhelming. Nikki says that it was she who dragged Deacon down, not the other way around. Victor says he doesn't understand why Nikki is spending time with 'scum' like Deacon. Nikki says she knows he doesn't understand, and is starting to believe that he never will. She says if he did understand what mattered to her, he never would have lied and kept Victoria from her. She asks if he didn't realize that doing that hurt her [Nikki] too. Victor tells her to stop making excuses. He says that this is a marriage, and every time things get tough, Nikki ends up in the arms of a lowlife, like she did with Bobby Marcino and David Chow. Nikki asks Victor how dare he throw that in her face. He says it's a pattern with her, and she needs to know it, and realize that following that pattern never helped things. Deacon silently watches the argument. The staff worker walks back up as Nikki yells at Victor to stop, and tells him to leave. Victor tells her that she'll know where to find him if or when she opens her eyes, and leaves. The worker says that Victor was right about Deacon and Nikki being bad for each other, because they fed into each other's drinking. Nikki and Deacon both agree, and Deacon says they'll stay away from each other. Nikki starts out to her therapy session, and runs into Deacon. She apologies for what Victor said, and says she doesn't know how Deacon took it without saying anything. Deacon says he figured if he did say something, Victor would send him to the emergency room. He tells Nikki that it might be best if they don't see each other any more. Nikki agrees, and wishes him luck. She leaves for her meeting. Nikki returns to her room, and crying, takes off her engagement ring. She has a flashback to Victor giving it to her, and telling her that he loves her. She then slips it back on, and falls back on the bed, crying softly. Deacon walks in. She's surprised, because they agreed not to see each other. Deacon says he'll leave if she wants, but he couldn't ignore her pain. She gets up, and hugs Deacon. They hold each other tightly, as she sobs. Victor gets home, and Meggie fixes him a drink, and comments on his bad mood. He tells her about finding Deacon at Solidarity House. He say that Nikki defended Deacon when Victor confronted him. Victor says it's unbelievable considering the trouble he's caused the family. Victor says that things were said that can't be taken back. Meggie sympathizes with him, and suggests he take a vacation to unwind. Victor thinks that would be like running from his problems, and doesn't see what good a vacation would do. Meggie says he spends all his time taking care of others, and not himself. Victor doesn't think it's a good time, with Nikki in rehab, and with the lawsuit. Meggie says that he and Nikki might need a little time apart, since she said she didn't want to see him. Meggie keeps at it, and suggests Vegas. Victor eventually warms up to the idea. Meggie says she'll pack his bags, and take care of all the arrangements. Meggie massages Victor's neck, and tells him that he might need an assistant on his trip, and that she'll go with him. He's very suggestible, and agrees with everything she tells him. It's clear that he's been drugged. Victor pulls Meggie into a kiss. JT and Mac are in their home, talking about going to Washington D.C. Mac knows that she suggested the move, but is worried about how her family will take it. She doesn't want Kay to think she's abandoning her right after Murphy had a stroke. JT says Kay will approve of Mac living her own life. He tells her that he has good news, and has been offered a position by the same non profit agency. Mac is thrilled for him. JT also made some calls and got some referrals for getting physical therapy in the area. He says the only problem is telling Victoria that he's taking Reed halfway across the country. Mac says if it were just her, she'd leave, but she's worried about how Victoria will react, and if moving with Reed is the right thing to do. Mac says Victoria could fight him for custody again. JT says he doesn't want that to happen, but they can't let what Victoria might do control their lives. Mac gets up, and grabs the phone, saying she's going to turn down the job. JT stops her, but Mac says it's the right thing to do, and maybe they can go when Reed is older. JT says that he's proud of Mac, because she's spent her whole life improving the world, and he's not going to stop her. He says almost dying changed things for him. His heart stopped beating, but he's still alive, and he thinks that happened for a reason. He strokes Mac's hair and says he wants what's best for their family, so she should call, and accept the job. She's not sure about moving Reed, but JT says they'll find a way to make things work. He says it's time for them to start their new lives. Mac smiles, and hugs him. JT says he just has to tell Victoria. Victoria and Billy are in Crimson Lights with Reed. Reed gives Victoria a picture he drew of his family (Billy, Victoria, Reed, Delia, JT and Mac). She loves it, and says she's going to hang it up on their fridge. Billy sends Reed to get a table, and then tells Victoria that his contact at City Hall is going to pull up all the documents that Heather filed at the Board of Elections. Victoria asks if he thinks they'll find a link between Heather and Victor that will explain why she helped him avoid jail time. Billy doesn't know, but says they'll soon find out. Heather is working in her office, when she gets a phone call about Billy requesting her campaign files. She asks herself what he could be up to. Billy gives Reed money to buy something, and he runs off to the counter. Billy can tell Victoria is feeling down about needing to drop Reed of at JT's soon. She says she's glad JT is out of the hospital, but her time with Reed went by very quickly. Billy knows how she feels, because he goes through that with Delia, as well. Victoria reminds Billy of the agreement she and JT made to get along better, and says she's going to do that. Almost losing JT put what's important in perspective for her. Reed comes back, and Victoria leaves with him. Billy says he's going to stay and check some emails. He finds the emails about Heather's donors, and spots Victor's name. Billy says that Victor bought a new district attorney. He then gets a call from Heather, asking him to meet her at his office. He agrees to come. Billy goes to Heather's office, and comments on the amount of her tv ads that have been airing. He asks her how she afforded it. Heather says that he's been looking into her finances, so he should be able to tell her. Billy says that he saw Victor's name in the contributors list, and is surprised he'd donate, since he doesn't like Heather. Billy says unless she did Victor some favors, like keeping him from getting arrested. Heather smiles and says she invited him there, because she thought he might believe that, and wanted to clear things up. Billy says it seems to him that Victor bought his way out of an arrest. Heather says that's not what happened, and that the motion Vance filed was to look at all of Newman's finances, when he would have only needed access to part of them. She says that she's sure the higher court will agree. Billy admits that what she's saying makes sense, but Victor is untrustworthy. Heather suggests they make a trade in exchange for Billy not blowing things out of proportion. Billy asks what she's offering. Heather tells him that it's something she guarantees he'll be interested in. Heather tells Billy what he'll get if she loses off screen. Billy asks what will happen if she wins. Heather says that Genoa City will have a DA whos' committed to putting Adam behind bars, which will be good for everyone, including Billy. Billy says he thinks Victor his behind her drive to prosecute Adam, as well. Heather says she's asking Billy as a friend, to keep his suspicions to himself. She says she hasn't done anything wrong, and if he goes public, it will destroy her reputation, and Genoa City will lose a good DA. She's barely winning the race, and doesn't want Billy to ruin things. Billy agrees not to publish anything without thinking over everything Heather said. Heather is relieved, and thanks him. Heather gets a call about setting up an interview, and tells Billy that they'll finish talking when she hangs up, but after the call is over, she looks up and realizes that Billy has left the office. Heather goes to her interview at Crimson Lights, and the interviewer says that considering the scandal with the last DA, and the great job Heather's done since, it's surprising she doesn't have a bigger lead. She asks if there's a reason Heather shouldn't be trusted. Victoria takes Reed to JT and Mac's home. Mac tells Reed she'll take him for ice cream so his parents can talk. Reed asks Victoria if it's okay, and she tells him it is. They leave. Victoria starts talking about how she was thinking about their pact to be civil. She thinks JT wants to talk about who'll have Reed for the holidays, but he stops her. JT tells Victoria that he and Mac have made a decision she should know about. Victoria gets anxious, and has a feeling she's not going to like what she hears. JT tells her about Mac's new job in Washington. He says that they leave tomorrow, and are taking Reed with them. Victoria is stunned, and slowly starts to get more upset. JT says they're not doing this to hurt her. Victoria says he's cutting out her heart by taking away her only child. She asks JT what happened to his plan to join the police force, and he tells her his heart can't take the stress. Victoria says he could work at Jimmy's or with Paul, or anywhere else, but he can't skip town with her son. JT stays calm, and says he wishes things could be different, but this is the way it has to be. He hangs his head down. Victoria asks why, and if this is what's best for him and Mac. JT says it's best for Reed too. Yelling, Victoria asks how ripping Reed away from his mom could be best for him. JT says they'll be very flexible with visitation, and that Reed will have opportunities to experience so much more in Washington. Victoria screams at JT to shut up because she doesn't want to hear about how wonderful the move will be. She pulls out Reed's drawing, and shows it to JT. She says that it shows how he pictures his family, and she was hoping she'd come to picture it the same way, but that won't happen if JT rips her and Reed apart. JT stares at the drawing. Victoria asks if he was even going to ask what she thought. JT says he has full custody, and didn't have to ask her permission. He says Mac's job starts next week, and that's why he can't give Victoria more time, but wishes he could. Victoria doesn't see why Mac can't go ahead, with JT following later. She sarcastically says that Mac is a saint, and will understand. JT says he doesn't want to leave on bad terms. Victoria gets in JT's face, and says it's not going to be a problem, because he's not leaving at all. She says there's no way she'll let him cross state lines with Reed. Victoria rushes out. At Crimson Lights, Reed asks Mac if they can go home, and she tells him that they have to give his parents time to talk. He asks if JT and Victoria are fighting, and she explains that adults sometimes have to talk about things that kids don't understand. Reed says they have to fight a lot. Mac says she knows one thing, it's that his parents both love him very much, and want him to be happy. Reed smiles. Mac takes Reed home, and he goes to put his coat away. She asks JT how things went, and he tells her that Victoria didn't take the news well. Mac asks if JT still wants to do this, and he kisses her and says he does. Reed returns, and JT asks him if he remembers the 'adventure' they took to New York. Reed does. JT tells him that he, Reed and Mac are going on another adventure to Washington. Reed asks if Victoria is coming too. JT tells Reed that his mom is going to stay with her family, but will visit him often, and she can talk to him on the phone all the time. Reed is upset, and says it won't be the same. Mac says it's okay to be sad, and that she's sad to leave her family too, but that the move is going to be awesome. Reed softly asks if they're ever coming back. JT says yes, and that Genoa City will always be their home. Reed hugs him. Billy goes home, and writes an article for Restless Style about Heather and Victor titled Victor Newman in DA payoff Scandal? He says that sources say Victor made donations to Heather, and that in return, she's going to reopen Adam's case. The article asks if this could also be why Victor was able to get out of a court ordered audit. It then asks if Heather is as corrupt as Owen Pomerantz, due to Victor and his checkbook. Victoria comes in, and is on the phone with Michael. He tells her that there's no legal way to stop JT, and that he's sorry. Victoria doesn't accept that, and hangs up. She tells Billy about JT and Mac's plans. Billy says it can't happen, but Victoria says she called Michael and he says nothing can be done, because JT has custody. Victoria says she can't lose Reed. Billy holds her, as she breaks down. Victoria is very worked up, and says she has one day to figure out a way to stop JT from leaving with Reed. Billy says Vance might have an idea, but it's hard when you dont have custody. Victoria says it's Victor's fault she lost custody, and that it all happened because of the stunt he pulled with JT. She sits down, and notices Billy's article. He tries to stop her, but she says she wants to read it. After she's read it, she asks if it's true. Billy isn't sure if he's going to publish it, but Victoria encourages him to finish it, and publish it. She says she wants the world to know what sort of person Victor really is.